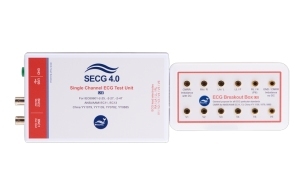 The ECG performance tester designed for compliance tests. Compliant with IEC 60601-2-25, IEC 60601-2-27, IEC 60601-2-47, ANSI/AAMI EC11, ANSI/AAMI EC13, YY1079, YY1139, YY0782, YY0885, JJG 760, JJG 1041, JJG 1042. 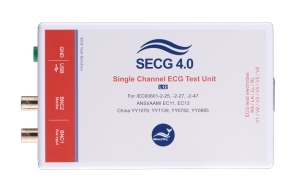 Single channel performance tester for diagnostic ECG, monitoring ECG and ambulatory ECG. 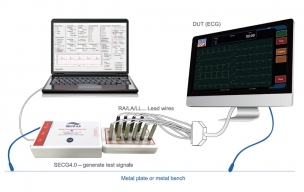 Built-in test circuits per defined in ECG standards. Excellent shielding and grounding design allows output amplitude and frequency accuracy < ± 1%. DC offset and pacemaker signal output can be adjustable. Load and replay customized ECG waveforms. Alternative input of external generator for arbitrary waveforms. SECG Assistant-E25 Auto setup for IEC60601-2-25:2011 performance tests. SECG Assistant-E27 Auto setup for IEC60601-2-27:2011 performance tests. SECG Assistant-E47 Auto setup for IEC60601-2-47:2012 performance tests. SECG Assistant-YY1079 Auto setup for China YY1079-2008 performance tests. SECG Assistant-YY1139 Auto setup for China YY1139-2013 performance tests. SECG Assistant-YY0782 Auto setup for China YY0782-2010 performance tests. SECG Assistant-YY0885 Auto setup for China YY0885-2013 performance tests. SECG Assistant-JJG760 Auto setup for China JJG760-2003 performance tests. SECG Assistant-JJG1042 Auto setup for China JJG1042-2008 performance tests.